The Snapseal travel mug has a one-piece leak-proof lid that allows for quick and easy cleaning while preventing leaks. 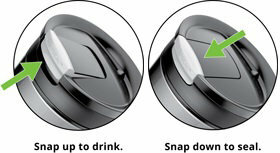 The SNAPSEAL lid easily snaps up for drinking and snaps closed to seal once you’ve finished. 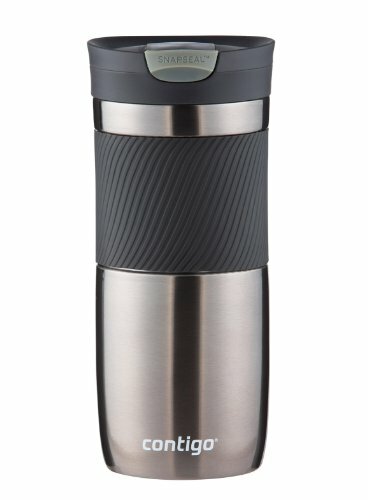 This travel mug has a comfortable grip that provides convenient one-handed drinking for both left- and right-handed users. The mug also fits most car cup-holders as well as most single-serve brewers. It also features a dishwasher-safe lid for easy cleaning. Made from durable stainless steel, the mug’s vacuum-insulated double-wall body ensures that hot beverages stay hot and cold beverages stay cold. The 16-ounce size keeps beverages hot for up to 6 hours and cold for up to 12 hours, while the 20-ounce size keeps beverages hot for up to 7 hours and cold for up to 18 hours. This double-wall construction not only retains temperature, but also prevents external condensation from forming so table tops remain free from moisture. Knowing that on-the-go beverages can be messy and complicated to use, Contigo developed a line of simple yet functionally innovative drinkware to help people face life's daily challenges. The products are stylish yet resilient, and sleek yet strong – the perfect combination of performance and grace. Contigo products give you the confidence you need to face the day, and pride in knowing that you bought the best of the best. Contigo is passionate about the products they create and believes you will be pleasantly surprised by the array of helpful innovations it offers. By using this Contigo product, you will both help the environment and also save money by taking your coffee, tea, water or juice with you in a reusable container instead of buying disposable cups or water bottles as you go. Research shows that coffee drinkers can save nearly 23 pounds of paper cup waste by toting around a reusable mug. New SnapSeal lid snaps shut to seal liquid into the mug, making it 100% leak proof and impossible to spill when in the closed position. The Snapseal tab snaps up easily allowing easy, on-the-go drinking whether commuting, hiking, or just dealing with a busy day. 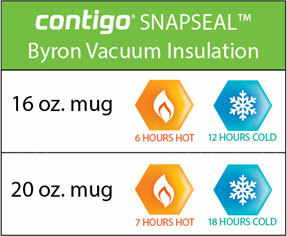 To use, consumers simply push up the “SnapSeal” tab, opening a reservoir to access the mug’s contents. After drinking is complete, snap the “SnapSeal” tab down to seal the lid again. An audible “click” – thoughtfully integrated by the design team – assures users that the lid is sealed again, 100% leak-proof and ready for whatever the day has in store. This Contigo travel mug also features an easy-to-clean lid. Simply snap open the SnapSeal tab to allow for easy access to the lid parts. The lid is top-rack dishwasher safe, and has no loose parts making it easy to clean. For easy care, the Contigo lid is top-rack dishwasher safe. It is recommended to hand wash the mug body to protect the finish. 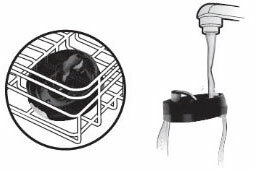 Always rinse the mug immediately after each use, and always store the mug with its lid removed to prevent moisture from becoming trapped in the body or lid after washing. Do not keep liquids that spoil easily, such as dairy, in the mug for prolonged periods. For use with hot or cold beverages.